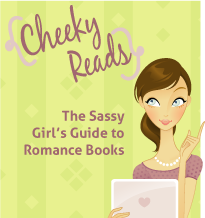 Cheeky Reads: Welcome Guest Alayna Williams - Author of Dark Oracle! Enter to Win! Welcome Guest Alayna Williams - Author of Dark Oracle! Enter to Win! For DARK ORACLE, I took a different approach to profiling my heroine, Tara. I didn't use any tried-and-true psychological or literary approaches. Instead, I did what Tara would. Tara Sheridan swore off criminal profiling after narrowly escaping a serial killer who left her scarred for life. By combining Tarot card divination with her own intuition, find a missing scientist who has unlocked the destructive secrets of dark energy. The card that came up most often in my random drawings to represent Tara was the Queen of Swords. The Queen of Swords depicts a woman staring pensively into a stormy sky. She’s lifting sword as if it’s quite sharp, and extends her hand as if she’s cut herself with it. The swords, in general, represent intellect. The Queen of swords traditionally represents sadness and mourning or a particularly clever woman. I always associated her with the Snow Queen from fairy tales – cold, isolated, withdrawn. 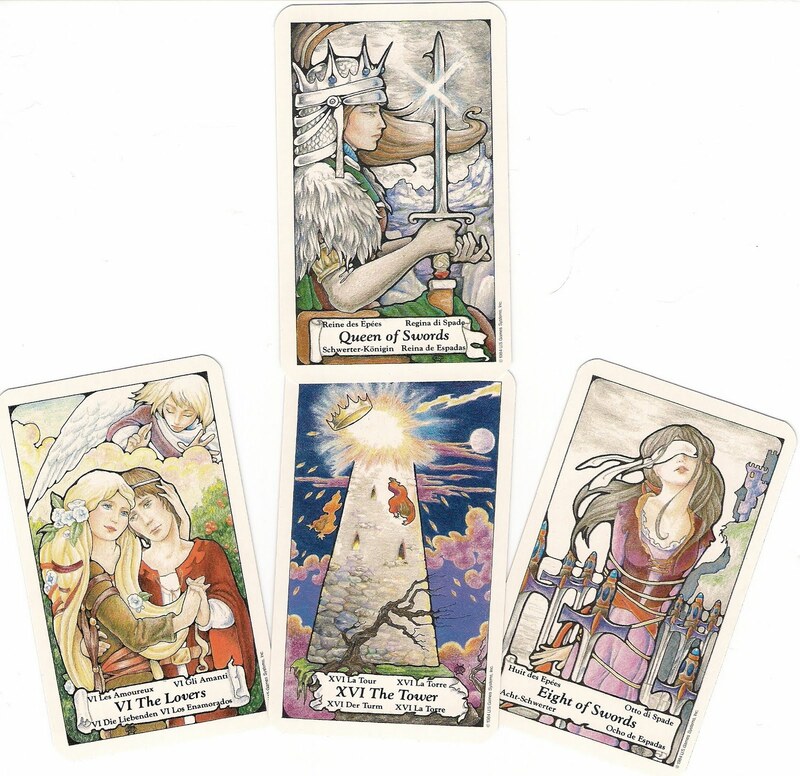 The Queen of Swords became the significator for Tara - an image that focused the rest of my Tarot card readings. Throughout writing DARK ORACLE, whenever I was stuck or needed more information, I'd draw a random card from my Tarot card deck as a story prompt. I wanted to learn more about the mental, physical, and spiritual challenges facing Tara. So I drew three cards to symbolize the metal, physical, and emotional challenges facing her in the story. For Tara's mental challenge, I drew the eight of swords. It shows a woman blindfolded and surrounded by sharp swords. The traditional meaning of this card involves imprisonment, crisis and bad news. Tara survived an attack by a serial killer years ago, and the event has left her scarred and in self-imposed exile. Her mental challenge will be to break out of the cycle of the past and see the future. For Tara's physical challenge, I drew the Tower. The Tower depicts lightning striking a tower and people falling to the ground. The Tower represents the case Tara has been asked to work on, an explosion of a particle accelerator. A scientist who's unlocked the secrets of dark energy has gone missing, and his disappearance could dangerously affect the balance of power in the world. For Tara's spiritual challenge, I drew the Lovers. It shows a man and woman in an embrace. Tara falls for the federal agent, Harry Li, who's working the missing scientist case. And she falls hard. But she struggles with giving herself over to a relationship, with learning to trust again. 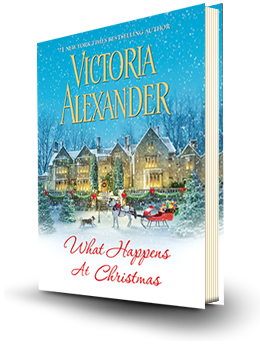 When he discovers her unorthodox methods, will Harry be able to trust Tara? Even Tara can't see that far into the future with her Tarot cards. She'll have to find out by experiencing these challenges, one by one. What about you - Have you ever tried Tarot Cards? Had your palm read or your future told? Did you read Embers from Alayna's alter ego Laura Bickle? What did you think? (I LOVED IT) Let us know and you'll be entered to win a copy of Dark Oracle from Alayna Williams! Both Embers and Dark Oracle are on my TBR list. Thanks for offering this giveaway! I personally haven't tried Tarot yet but would love to! Thanks for the chance! I have never had a Tarot card reading, had my fortune told or my palm read. The closest I've come is a fortune cookie - pretty random, LOL. I don't think I want to know what the future holds, I'd rather be surprised. I have Embers on my TBR shelf and will be reading it very soon, so I don't have an opinion quite yet to share. I have had my palm read and a tarot reading. I am always fascinated by both. I have not read Embers but I want to read it. I have not done Tarot cards. But I do love the artwork on them, they are so creative. I have not read Embers either but it is on my wishlist as well. I've never tried tarot cards and I have never had my palm read; however,I am intrested in the history behind both. Busy Working Mama, it's a lot of fun. I love the randomness of the cards that feeds the story. Thanks, tetewa! I've been reading cards since I was a teenager. I learned on the Hanson-Roberts deck, which is a very gentle deck. 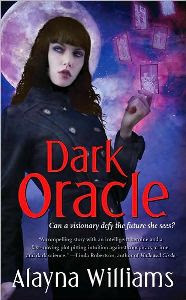 Ashley, there's astrology coming in the sequel to DARK ORACLE, ROGUE ORACLE. It was a lot of fun to learn about. I cast my own chart just for fun. Barbara E, thanks for adding EMBERS to your TBR shelf! CrystalGB, I've never had my palm read. What was it like? donnas, yes, there's some beautiful artwork! It's what attracted me to them to begin with, I think. throuthehaze, enjoy your cards! 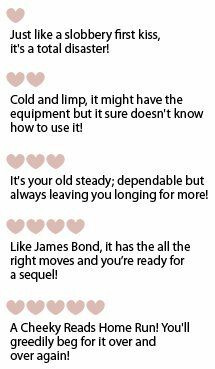 Which deck did you pick up? enyl, there's not much confirmed history behind the Tarot. We do know that it's been around for a few centuries, and that it's the forerunner of the modern playing card deck. Tarot cards were also used to play an old game called tarocchi. I'm fascinated by Tarot reading...I've always wanted to learn more about it and learn how to practice it. This sounds like such a great premise for a story. Thanks so much, Anna! I tried to explain the Tarot in DARK ORACLE in a way that folks who aren't very familiar with it will be able to follow the spreads and meanings. I love that you used Tarot Cards to describe a character. Don't think I've heard of that before! How clever. Best wishes on the success of your book Dark Oracle! It will be on my TBR list for sure! Thanks, Deanna! I'm very excited, and I'm thrilled that you're adding DARK ORACLE to your TBR pile! Got my own set of cards but don't know how to use it! Been to a lot of readers, too, not impressed but always intrigued. Very interested in Alayna's book! One of the best sources on card reading on the internet is aeclectic.net. They have a lot of info on the interpretations of cards, spreads, and different decks. Good luck!